Often when you talk to climbers, you’ll hear them talk about travelling to all sorts of remote locations or famous climbing spots like the Yosemite Valley or Southern France. For the climber, the search is always on for that next great route and this can take us all over the world. I’ve had the privilege of climbing some of the most iconic routes in the world, like El Capitan in the Yosemite Valley and the more of these routes you do, the more you want to discover and climb. If you live in the United Kingdom, however, you might not need to travel very far to experience great climbing as there are some very well known climbing spots around the country. My favorite destination in the United Kingdom is the Lake District and if you catch it during the right time of year (in the summer months from May to July), you’re in for a real treat. It is well recorded that rock climbing began in the Lake District as a recreational activity with the first ascent of Nape’s Needle on the now infamous Nape’s Crag way back in June 1886. The climb is now seen photographed by almost every visitor to the area and despite not being a very long route (just 65 feet high) it has become a rite of passage of sorts to ascend this climb. 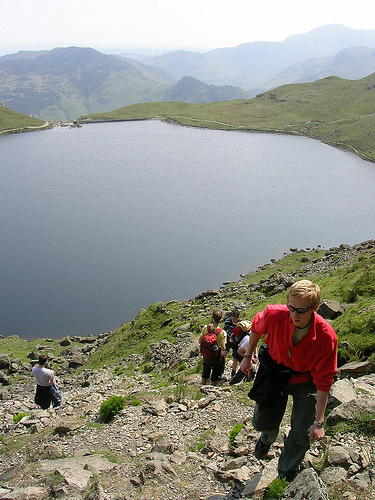 Ever since, rock climbing has become more and more popular in the area and today, thousands of climbers flock to the area each year to climb in the Lake District. When I take new climbers or climbers new to the Lake District out for a day of climbing, I’ll always start with Borrowdale. The crags and climbing offered here are fantastic and varied – there are literally routes for every skill of climber and the most visited place in Borrowdale is Shepard’s Crag. To get there take the Keswick to Borrowdale Road until you reach the Swiss Lodore Hotel. Just a little past it and before you get to the Barrowdale Hotel you’ll find the High Lodore Farm where parking is available. If you prefer, you can just walk or take the available bus service from Keswick. While you’re there, you should explore the many different climbs but before you go, an ascent of Little Chamonix is essential – it is my favourite climb in the Lake District and one I have done a good number of times. It’s a V Diff climb (grade III), so beginners will struggle here and is a three pitch route. As with most popular climbs, the rock can be a bit polished, making it harder to ascend than it would have been 10 years ago. The route is not bolted so trad gear is essential – the route has been done often with just nuts, but a cam or two will come in handy. Langdale itself is filled with many different crags and boulders all of which are worth a visit, but when I go to Langdale I head straight to one in particular – Gimmer Crag. When you get to the area, park at Old Dungeon Ghyll and follow the path marked to take you to Raven Crag. About 200m up the path, another will branch to the left to take you to Gimmer Crag. The path is signposted. Upon arriving at the crag, you’ll notice that your initial impression of the crag looking very challenging is half true. While most of the routes are graded MS, MVS and VS, there are a lot of hold and chimneys for you to climb with. These are my favourite and two examples of the many great crags, buttresses and routes available across the Lake District and for me to list all of them would mean writing a book. Luckily for you, many books about climbing in the Lake District do exist. The most useful of these is the one compiled by the Fell and Rock Climbing Club based in Cumbria. It is titled ‘Lake District Rock Climbs’ and is available on Amazon. Another book that I’ve used to the point of it falling apart is ‘Scrambles and Easy Climbs in the Lake District’ by Jon Sparks and Judith Brown which you can also pick up on Amazon. Both of these books have some great information for new and old visitors to the area and I still haven’t completed all the routes I want to from these books even though I visit the area sometimes up to twice a year. If you want a more structured approach to your explorations of the climbing the Lake District offers, why not contact the Fell and Rock Climbing Club? They have a contact form on their website (which also has a HUGE database of routes in Cumbria and surrounds). Visit http://www.frcc.co.uk/ for more information about this organisation. If you’ve ever been on a climbing holiday, you’ll know that unless you want to torture your body, you’ll want some downtime from the rock and the Lake District is a great place for you to find this. It’s not called the Lake District for nothing and iconic lakes like Lake Windermere or Lake Coniston offer amazing day trips – especially if you want to get into a canoe or sailboat and take a trip around the lake. The aquarium and visitors centre at Lake Windermere is worth a visit too. If you want to get into the mountains, you’ll find a huge selection of hikes and walks in the area and some of my favourite are in Coniston Old Man. There is a great hike that will take you past a few mountain pools and, if you’re feeling particularly adventurous, has a sheltered, high camping point. 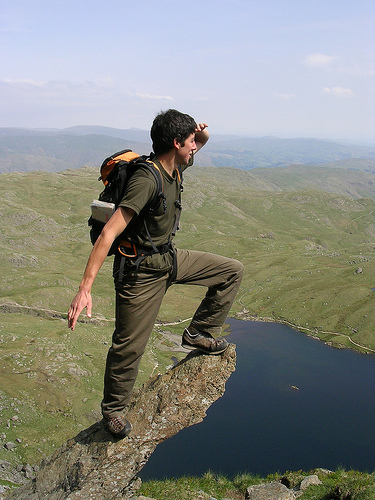 The Lake District is the kind of place you can visit again and again and never experience everything it has to offer – climbing and activity wise. This entry was posted in Europe, Land Sports, Rock Climbing, Travel and tagged Climbing, Cumbria, England, UK, United Kingdom. Bookmark the permalink.